Hailing all the way from Tasmania, Australia, death metal 4-piece Psycroptic are now on their 7th album, entitled As The Kingdom Drowns, and have just released this guitar and bass playthrough for their song “We Were The Keepers” featuring guitarist Joe Haley and bassist Todd Stern. If that weren’t enough, this music video-esc performance takes place in Iceland, which really is a sight to behold. 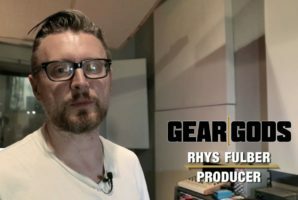 Watch and be amazed, only right here, on Gear Gods! Aesthetically, this is one of the best-shot playthroughs we’ve had the pleasure of featuring here on Gear Gods in a hot minute, and sonically it’s even better! These dudes have some of the tastiest and techiest riffs out there, and when they’re combined with relentless blast beats and crushing vocals, you know you’re gonna be in for a treat. You can buy/stream As The Kingdom Drowns on the band’s Bandcamp, as well as stream it on Apple Music and Google Play.